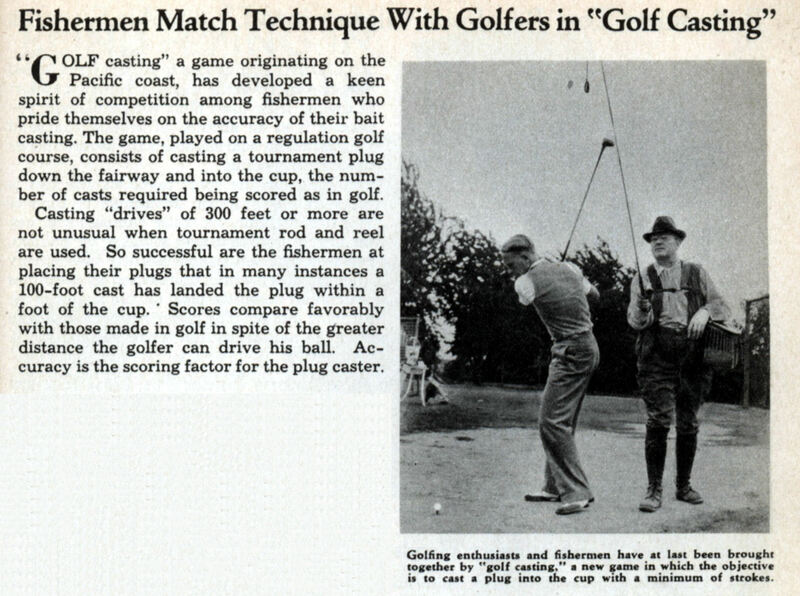 GOLF casting” a game originating on the Pacific coast, has developed a keen spirit of competition among fishermen who pride themselves on the accuracy of their bait casting. The game, played on a regulation golf course, consists of casting a tournament plug down the fairway and into the cup, the number of casts required being scored as in golf. Casting “drives” of 300 feet or more are not unusual when tournament rod and reel are used. So successful are the fishermen at placing their plugs that in many instances a 100-foot cast has landed the plug within a foot of the cup. Scores compare favorably with those made in golf in spite of the greater distance the golfer can drive his ball. Accuracy is the scoring factor for the plug caster.